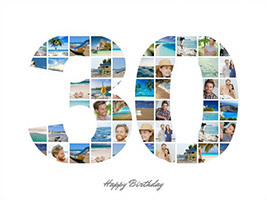 Cheap photo collage – 250 templates - 100% FREE delivery! Creating a cheap photo collage these days is very simple. 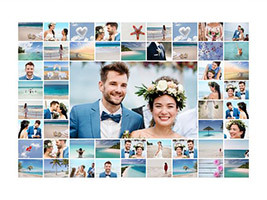 After all, not only is there a myriad of possibilities to create a photo collage online but there are also some very cheap options too: These are either printed as posters or in compact sizes. This considerably reduces the price. But if you want to order cheap photo collage poster prints, you don’t have to compromise on design. The collage templates at photo-collage.net are always free of charge, no matter which collage you decide on. 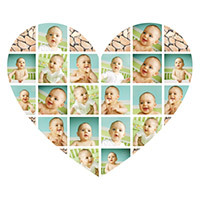 This way you can save money even when creating with the large collage maker. Tip: Ordering your collage print as a poster is the cheapest option. If you want to create a cheap photo collage print as a gift, your best bet is the poster. 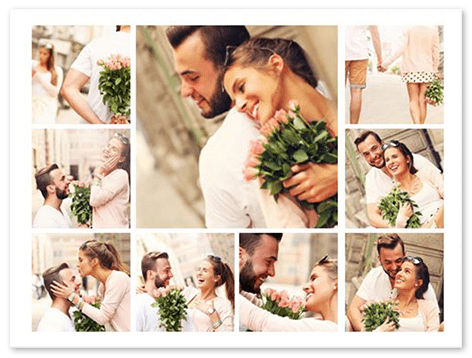 These photo collages are considerably cheaper than the collage on canvas and are available in two cheap versions, at very low cost. 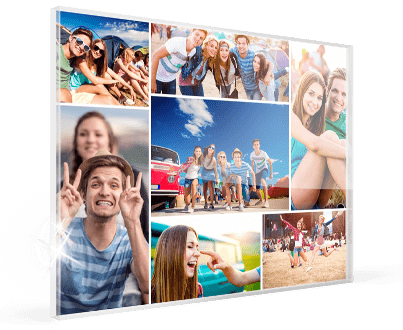 Decide on a compact size for your print and you’ll have your personalised photo collage at a low price. But remember: If you want to give your collage as a gift, remember to take delivery times into consideration. No matter whether the photo collage was cheap or not, if it’s not delivered in time, the surprise is ruined.